Without Seven’s cooking juggernaut to contend with, Nine was able to have its first official win of the ratings year. 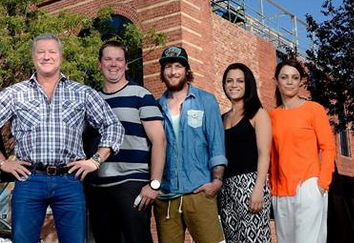 Nine network share was 30.5% then Seven 24.4%, TEN 23.8%, ABC 17.0% and SBS 4.3%. Nine News topped with night with 1.08m / 976,000 viewers then The Block (1.07m / 830,000), A Current Affair (830,000), Hot Seat (537,000) and Sherlock (351,000 in 4 cities). Seven didn’t crack one million with Seven News (989,000 / 920,000), Home and Away (870,000), Tricked (565,000), Million Dollar Minute (429,000) and disappointing numbers for Young, Lazy and Driving Us Crazy (396,000). A Men’s Ski Slopestyle Final was TEN’s best at 700,000 in 4 cities followed by TEN Eyewitness News (608,000), Sochi Winter Olympics (485,000 / 339,000), The Project (415,000 / 350,000) and The Biggest Loser (394,000). ABC News (834,000) led ABC1 then 7:30 (678,000), Qi (646,000), Clarke and Dawe (486,000) and Kids on Speed? (438,000). On SBS ONE it was Gourmet Farmer (224,000), Italy Unpacked (214,000), Mexican Fiesta with Peter Kuruvita (186,000) and World News Australia (121,000). Rectify was 92.000. Sochi Winter Olympics coverage led multichannels on ONE with 339,000 and a. 7.6% share. Home and Away is still rating well, but the quality is slipping and the stories so tired, it won’t be long before audience fatigue sets in. Seven need to step in before it nosedives like Neighbours. Seven are gonna have Plenty of Black Holes on Thursdays once Nine’s The Footy Show’s Return in March. I may be a bit dumb but what is HIMYM? Really enjoyed Peter Kuruvita’s new show. I found Young, Drunk and Crazy pretty silly and not what I was expecting at all. Won’t be taking a second look and by the sounds of many here, I’m not alone. TEN need to start their news at 5.30, have a half hour of the project at 6.30 then their ‘family entertainment show’ at 7pm. I think The Project would work better as either a late night panel show (10.30pm onwards) or as an afternoon lead in (4pm). It’s just not strong enough to be the leader of the primetime evening – even when it did once hit 1m viewers a few years ago, it was still 4th in the timeslot (and often Neighbours gets better numbers on 11). I find Sunrise and Studio 10 must stronger programmes, which are not in primetime. The Project really is comparabale to The Daily Edition. Although it does have some great guests and strong moments, ten needs to do something to the 6 – 7.30pm timeslot and The Project is too weak. Ten have the perfect opportunity to offer a 1/2 hr national news bulletin at 6pm (as a major point of difference), perhaps a game show at 6.30pm, then return reality tv to 7pm where it started. The Project should go… I know, I know, but the reality is no matter the show, no matter the reason, a lead into 7:30 cannot do 350K. TEN’s scheduling (moving shows all around the schedule) denies viewers the chance to get into ‘pattern viewing’. If you miss a few episodes then, “oh well, I can’t be bothered now” kicks in. They have destroyed SYTYCD, they have destroyed Biggest Loser, their programmers are the worst in Australian TV since Bruce Gyngal said: “welcome to television”. It’s really sad to see this once great Network in the hands of such fools. Guy, I’m so with you there! Why the hell are they holding off on HIMYM?!?! I’ve basically been spending the past few Thursdays catching up on recorded tv. There is nothing!! The Project is a serious drag. EIther cull the show totally or bump it back to a half hour. Wow Tricked dropped off big time from the premiere. That Young and Lazy show i didn’t even bother with it. Trash tv. Seven need to bring back HIMYM! I really enjoyed young, lazy and driving us crazy. Was a great show and great format. Wake Up numbers are slowly improving – I assume this is because of Sochi. They would be pleased that its now beating ABC on the primary channel. I saw a bit of TLDUC while waiting for Rectify to start. Though I didn’t wait around for the final credits to see who was responsible. Recruit a bunch of young, attention-seeking alcoholics with no hope of full-time employment and give them money to buy booze. The results were rather predictable and the only surprising thing is that Ten didn’t try it first. Young, Lazy and Driving Us Crazy together with Tricked were the biggest pieces of rubbish since…I can’t remember when. So Young, Lazy and Driving Us Crazy That bad? I wanted to watch it, but forgot about it. Might give it a miss altogether now. @DansDans Perfect! I think you got it LOL. I reckon we might see some Dynamo repeats on Seven next Thursday. Did anyone see Young Lazy and Driving us Crazy? What a load of rubbish, worst show in years, not even TEN would have broadcast it! I noticed in the credits that a production company called Matchbox produced it, they should change their name to Rubbishbox.Just can’t believe Seven even put it to air!